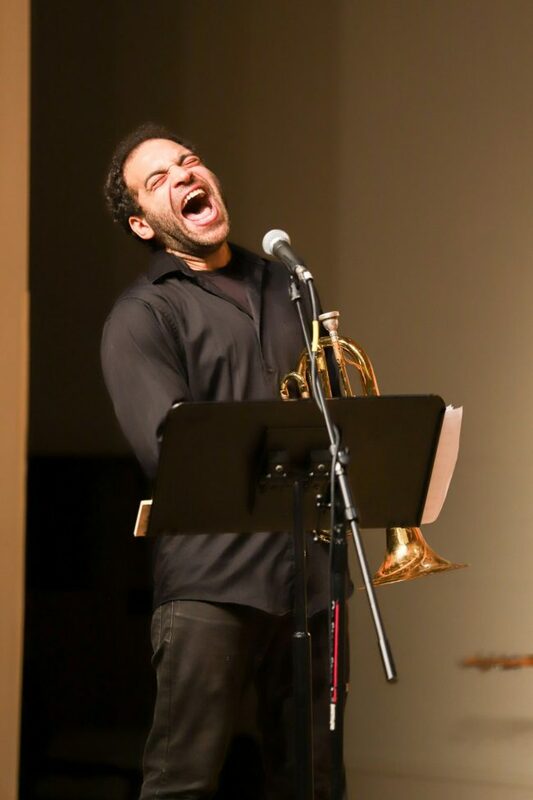 Friday, Nov. 9, the College of William and Mary assistant professor of music David Dominique performed music from his new album, “Mask,” with a seven-piece jazz ensemble in Ewell Hall as part of the Ewell Concert Series. The performance kicks off his upcoming tour, which includes shows in Washington, D.C.; New York City, New York; Boston, Massachusetts; Los Angeles, California and Baltimore, Maryland. Dominique’s first album, “Ritual,” was released in 2013 to critical praise. This year, Dominique released his new album, “Mask,” which he described as a quasi-surrealist musical dreamscape and said at its best gives the listener a window into his musical stream of consciousness. Dominique said that “Mask” is an opportunity to use many of the ideas and inspirations that he has accumulated throughout his career. “I’ve sought to create coherent musical forms by juxtaposing these elements that might seem disparate if you were to describe them verbally, but if you hear it, it makes sense,” Dominique said. Dominique said the difference between “Ritual” and “Mask” falls in the five-year gap between the two albums. He said there was not only a difference of maturity, but a difference of style, technology and method as well. “‘Ritual’ was recorded to analog tape, so I think ‘Ritual’ for better or worse is a bit more rough around the edges,” Dominique said. Dominique said that “Ritual” was also written over a period of five years, before he had refined his compositional approach and aesthetics. Dominique said that “Mask” is more smooth, nuanced and detailed. “They represent different eras of output, though I think they still sound like they came from the same composer,” Dominique said. While many of the songs on “Ritual” underwent multiple stages of development, as they were performed and collaborated on over several years, Dominique said that “Mask” was written mostly in solitude with just his piano or horn and was workshopped very close to recording. “Mask” was recorded in Pasadena, California with engineer and co-producer Nolan Shaheed, who had previously worked with Miles Davis, Stevie Wonder and Diana Ross. Shaheed also makes a cameo on “Mask” playing the trumpet. Dominique said that at first, it was intimidating working with Shaheed. Despite Shaheed’s impressive repertoire, Dominique said he is a humble, generous person. “It was, but I mean, you kind of have to forget about that and do what you’ve been working towards,” Dominique said. Much of the inspiration for “Mask” comes from Dominique’s personal struggles, including loss of several relatives, moving around the country and an upheaval of musical identity, partially stemming from being in graduate school for music. “There was a lot of upheaval in my life during the time that I was writing that music,” Dominique said. As a result, Dominique said he felt compelled to mold his tastes to what was supported and promoted by the academic institution. As a result, Dominique said that “Mask” is an exuberant expression of relief. “Realizing I can make music for myself and it’s just as valid in multiple forums, including the academic forum,” Dominique said. Additionally, Dominique said that teaching, especially at the College, has influenced his view on composing and songwriting. Dominique said that his tactics of teaching are less about trying to instill certain tastes or stylistic choices in his students and more about passing along his process of self-critique. “I want to teach students how to be thoughtful and critical about their composing,” Dominique said. At the same time, Dominique said he wants his advice to be heartfelt and authentic. “I wouldn’t suggest anything to them that I wouldn’t do all the time,” Dominique said. Dominique said his students have shown passion and dedication to composing, covering a wide range of genres, from rock to EDM to hip-hop. “I haven’t really addressed this, but I’ve been so surprised, I’ve been so heartened and encouraged by the depth of engagement of all my students,” Dominique said. On the night of the Nov. 9 concert, the audience was filled with faculty, students and people from the Williamsburg community. One student, Ethan Shelburne ’21, who had been taught by Dominique, expressed excitement at getting to see him perform. “He’s very classically trained, but he also has this huge passion for experimentation and other modes of music, and you can definitely feel that in his work,” Shelburne said. Dominique and his ensemble gave passionate and invigorating performances that demonstrated not only their skill as musicians but as entertainers. Between songs, Dominique would frequently pause to tell a story about the origin and personal meaning of the composition, which ranged from comical to tragic. After one performance, Dominique paused to address the members of the College community in the audience, thanking them for their support, kindness and creativity as students and colleagues. “One of the most important things I’ve learned throughout my career as an artist is the importance of being yourself, and it’s really inspiring to see a community that really encourages and allows people to do that,” Dominique said. At the end of the performance, audience members crowded out to the lobby and got the chance to purchase a copy of “Mask” as well as speak to Dominique and other ensemble members. The response of audience members was highly enthusiastic.